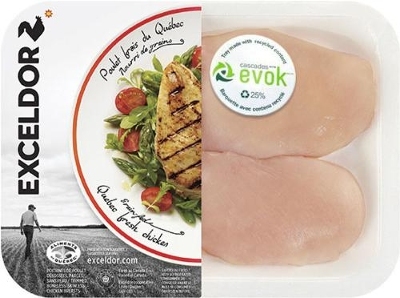 US poultry processor Exceldor is using Cascades’ EVOK packaging with 25% recycled contents on most of its fresh products since February 2014. As said, EVOK is the first polystyrene foam food tray (XPS) in North America to contain recycled material and to be found on grocery shelves. “By incorporating 25% of recycled polystyrene (PS) into our products, we have reduced greenhouse gas emissions (GHG) by 20% compared with our traditional PS foam trays,” explains Luc Langevin, President and Chief Operating Officer of Cascades Specialty Products Group. The EVOK trays are designed for packaging meats, poultry, fish and seafood, as well as fresh fruit and vegetables. In addition to its eco-friendly nature, the product has achieved a UL Environment claim validation for its recycled content. The recycled material used to make EVOK trays is also approved by the US Food and Drug Administration (FDA) and the Canadian Food Inspection Agency (CFIA). Exceldor, has chosen to use EVOK packaging for all of its polystyrene foam-packaged products with the aim of reducing the environmental impact. According to Cascades, adopting the new EVOK packages will allow Exceldor to reduce its annual GHG by close to 37 tons, or the equivalent of the yearly emissions produced by 15 compact cars. “We are very proud to be using the new EVOK trays from Cascades. At Exceldor, we always strive to do more, and our commitment to the environment is no exception. It was only natural for Exceldor to choose EVOK packaging, and to offer a responsible alternative to our customers,” says Isabelle Drouin, Vice-President of Communications and Marketing at Exceldor.